Pay sum of rupees 5000/- (Five thousand only) as a processing fee through cheque on the name of FREEDOM COMPUTER INSTITUTE or Bank Draft in favour of FREEDOM COMPUTER INSTITUTE Payable at Lucknow. The affiliation fee is non- refundable. Theory Class Room, Lab Class Room with a minimum of 4 computers and Separate office for counselling, with Internet Connection. A photo copy of Metric Certificate. A photo copy of PAN Card or Driving License or Voter ID Card. Two latest colour photographs of yourself. Flex Board 10x4 (without frame) 1 Pc. Fees Receipt Book 2 Pcs. Centre Registration & Authorization Name on Our website. ASC Login ID & Password on website. Renewal of authorization for the next year will be made FREE on the account of admission of at least 50(fifty) students in a year otherwise. renewal of authorization fee worth Rs. 1000/- (One Thousand) only will be chargeable. Registration form of each and every student must reach Head office/Regional office within maximum 15 days of admission of the student. 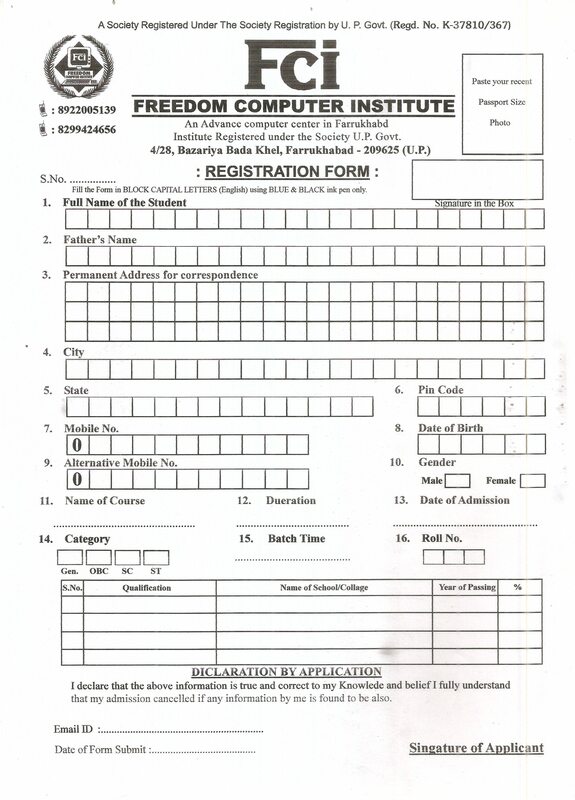 Submit of admission form without H.O's share not to be considered under any circumstances and any kinds of Issue duplicate copy of any kinds of kits provided by our organization without the consent of Head office is strictly prohibited. The organization reserves its right to make any additions or alteration in its terms and conditions/ renewal fee/Royalty fee without any prior notice. Any types of fee will not be refundable in any circumstances. No liabilities regarding the staff salaries, taxes, computer's software & your official problems will be borne by H.O. ELIGIBILITY CRITERIA FOR FREEDOM COMPUTER INSTITUTE STUDY CENTRE. Should be willing to invest required amount of money in setting up a centre with proper infrastructure and main power. Should have commitment for providing quality training to students. Administrator / Manager Knowledge of Computer Software Training, Experience, having Good Management Skills. Faculty Thought knowledge of subject, disciplined, Student's problem solving capacity. Counsellor / Receptionist Pleasant personality with good communication skills, knowledge of computer courses, disciplined.